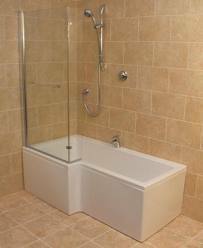 When space is limited, a bath screen provides a shower enclosure without a shower enclosure. Wall mounted Bath Screens provide a modern alternative to the shower curtain. 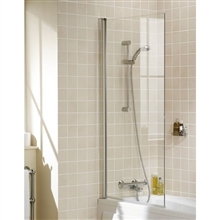 Described as Semi Frameless, this £164 Simpsons Design Semi-Frameless Single Bath Screen, includes a hinged connection via a stainless steel band that hides screws and fixings. 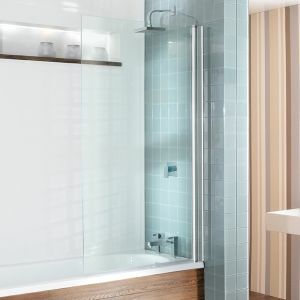 The Upsilon Frameless Bath Shower Screen with Pivot, allows for the screen to be opened and pushed towards the tap end, as it were. It includes a towel rail. The usual price for this type of door ranges between £70 and £170 give or take, depending on the quality and thickness of the glass. A similar type of screen, but plain and square. No patterns, additions or fuss, just a piece of glass connected to the wall via a slimline stainless steel connection strip. L-Shaped Bath Screens are usually fixed. Too many moving parts and two pieces of glass does not always work well with movement! The key to the screen is good seals. The central hinge point of the glass will usually have a stainless connector, this needs a seal as well as the glass.